All Bangkok Taxi have meters and are air-conditioned. They come in many different colors and are usually in plentiful supply. 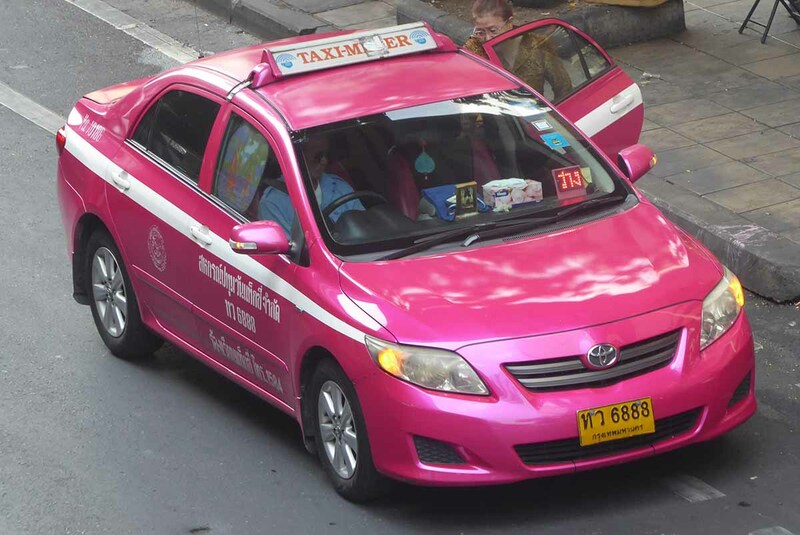 Getting around Bangkok by Taxi can be cheap & easy, depending on the traffic. By international standards, they are also good value for money with a meter starting price of 35 baht which rises per minute or kilometer. 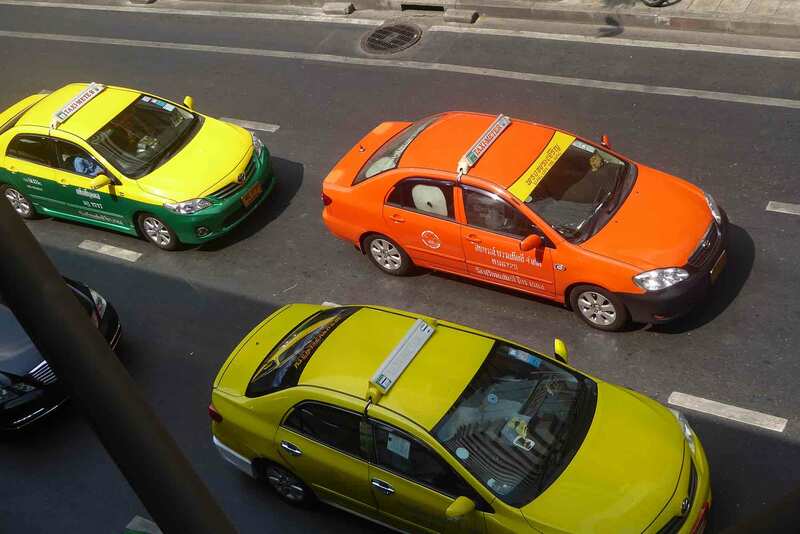 A lot of tourists get overcharged by taxis in Bangkok, but this is often the tourist’s fault. The common mistake is leaning through the window with a map, pointing at a destination and then asking “how much”? This is an invitation for the driver to quote you a price and not use the meter. This will usually end up with you paying up to five times more than on the meter. NEVER ASK “how much”! Just get in and show the driver where you want to go and ask him to use the meter. If they won’t get out and catch another one. It is illegal for them not to use a meter. Taxi fares on the meter in Bangkok are cheap. Some drivers will ask you through the window your destination before they let you in. They may well refuse your destination if it takes them to an area with heavy traffic. This is illegal but they do it anyway. Also, make sure that they turn on the meter when you start your journey. Always hail a passing taxi and never use taxis that are always parked outside hotels or tourist attractions. This is a particular problem around the Grand Palace and Khaosan Road. These drivers make a living out of overcharging tourists by not using meters and vastly inflating fares. Taxis that are available have a red or green light at the bottom left-hand side of the windscreen, no red light means it’s already occupied. To hail a taxi just wave your hand and it should stop. Don’t agree to visit gem or tailor’s shops if a driver asks you. These are scams. Never ask a driver to recommend a restaurant or anywhere else as they will take you to a place that pays the driver commission and not a place where the food is good, and you will certainly be overcharged. Always be clear about your destination. Most drivers understand the names of major tourist attractions but their standard of English is generally poor. It is a good idea to ask your hotel to write the name of your destination in the Thai language if you are unsure. It shouldn’t cost more than 100 baht to go anywhere within 10 kilometers of central Bangkok. If you take a Tollway remember that you must pay the Tollway fee which is 45 – 70 baht. Don’t try to pay taxi fares with large bills (500/1000) as drivers usually don’t have change. Check you have change before you enter. There is no need to tip taxi drivers. You can book a reliable taxi online to pick you up at your hotel or another place. If you want to travel out of the city you can book a private taxi transfer here. Grab Taxi – download the App and you can book a taxi on your mobile. 24-hour service. All Thai Taxis are a reliable company with nice cars and polite drivers. Download their app and book online or phone the call center 02 018 9799. You can also hail them on the street. 24-hour service. All Thai Taxi & Grab apps can be downloaded at Google Play Store. Rates are the same as ordinary metered taxis.